From the very beginning of a performance coach’s career, the three planes of motion (sagittal, frontal, and transverse) are taught in basic anatomy classes. Figure 1 below shows these three planes of motion. However, as coaches progress into full-time work, many programs implement exercises which utilize primarily the sagittal plane (step ups, forward lunges, back squats, bench press), while commonly neglecting both the frontal and transverse planes of motion. Many coaches may argue that the majority of movements in athletic competition occur in the sagittal plane, or that strength is generally transferrable to all planes of motion. These arguments lead to the primarily sagittal based training programs regularly implemented. However, the movement in all three planes of motion places significantly different biomechanical and kinetic chain reaction demands upon the body. As the understanding of movement through each joint of the body is improved, the importance of each plane of motion becomes apparent in all movement patterns executed. Before the methods of multi-dimensional (3-D) training are described, the basic concepts of the three planes of motion must be well understood by all performance coaches. Figure 1 below displays each of the planes of motion (sagittal, frontal, and transverse) in respect to their application within the body. 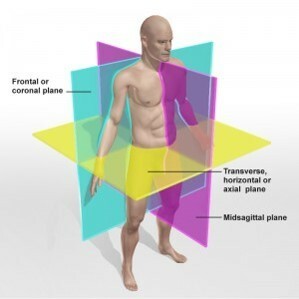 Sagittal Plane: Separates the body into a left and right section. Any type of flexion and extension movements require the utilization of the sagittal plane of motion. Frontal Plane: Separates the body into the anterior and posterior sections. Lateral movements require the use of the frontal plane of motion. Transverse Plane: Separates the body into the upper and lower sections. Anytime rotation is completed within a movement the transverse plane of motion is used. This is not new information to many coaches. At some point, each of these planes was likely even memorized for some type of certification test. However, the implementation of exercises to each of the planes of motion can become difficult and sometimes complex. This does not have to be the case though, as there are simple strategies that can be applied to maximize the ability of each joint to function appropriately in its primary plane of motion. Before these strategies are covered in greater detail, it is necessary every coach understand the value of all three planes of motion in even basic movements. A skill as simple as walking or running straight ahead is viewed as a primarily sagittal movement by many. However, upon closer look, the application of a joint by joint approach reveals the importance of 3-D training in even the most “sagittal” of movements completed. The task of walking or running is completed by nearly every person/athlete on a daily basis. During normal gait, all three planes of motion are present and are required for efficient movement. As the foot strikes the ground, the subtalar joint experiences eversion, which leads to a pronation at the foot. This pronation of the ankle leads to tibial medial rotation, femur medial rotation, and eventually hip internal rotation. 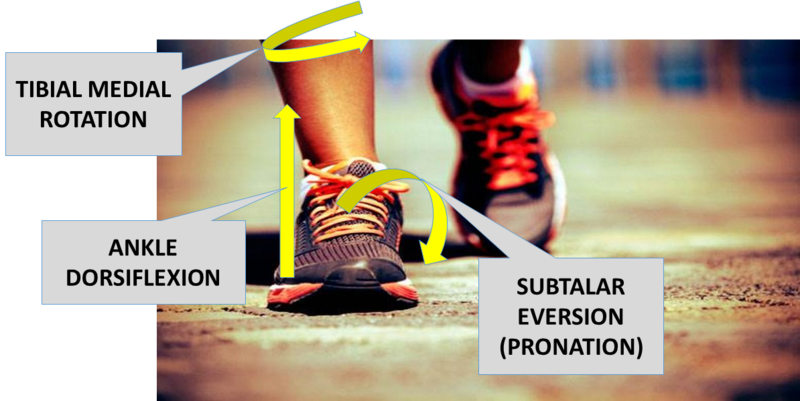 Finally, ankle dorsiflexion is required throughout gait to achieve appropriate toe-off through the big toe. These movements are all required and summate to create eccentric loading of the glute, which should be the primary driver of all hip extension. Each of these joints is required to function to a high-extent if appropriate movement is to occur. This mechanism, termed tri-planar loading, clearly demonstrates the importance of all three planes of motion in everyday tasks. The subtalar joint experiences a frontal plane of motion change (eversion), the tibia experiences transverse plane of motion change (medial rotation), and the ankle experiences sagittal plane change (dorsiflexion). Figure 2 below depicts this tri-planar loading, which should occur in every stride taken. As this loading pattern occurs the glute is able to experience eccentric loading and an athlete experiences efficient movement. It is important to note this pronation and tibial rotation occurring with every step, although extremely important for appropriate and efficient movement, does not function on the “more is better” approach. Every athlete must attain the proprioceptive control over their arch to ensure excessive pronation and tibial medial rotation do not occur, as this will lead to valgus stress placed upon the knee. In fact, many professionals measure this “medial-drift” occurring at the foot to determine potential pathologies. Besides the improved efficiency of movement through appropriate joint articulation and tri-planar loading, 3-D training also leads to a reduction in the likelihood of injury. 3-D training, when programmed appropriately, leads to improved motor patterning, a reduction in biomechanical deficiencies, increased range of motion, the creation of tissue tolerance, force absorption capabilities, and improved strength in extreme, or abnormally utilized tissue lengths. Ultimately, the implementation of 3-D training leads to the ability of an athlete to create proprioceptive control and strategies to move in and out of disadvantageous positions which occur in athletics. The benefits and adaptations listed above are just a few of the many improvements seen with the implementation of 3-D training methods. When movements are completed in multiple planes, tissue lengths can extend far beyond an athlete’s active range of motion and into their passive length capacities. 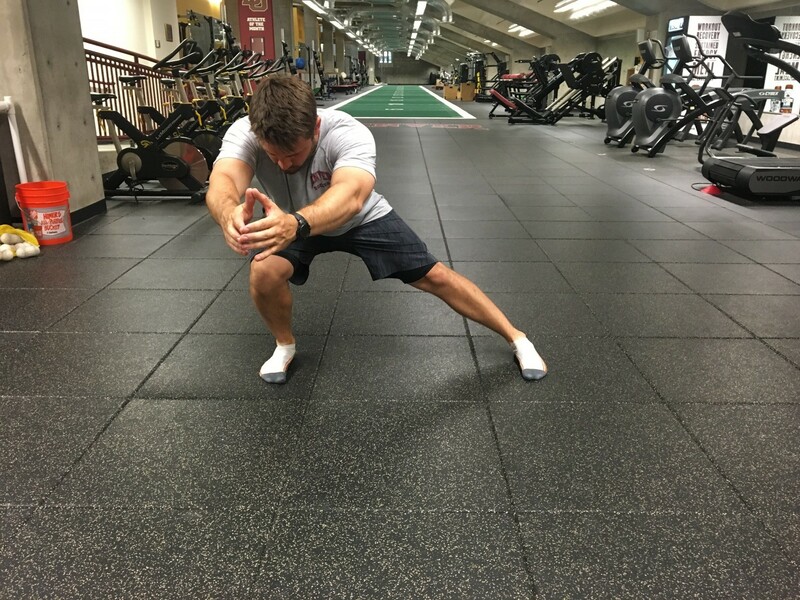 A lateral lunge is a simple example of this passive range of motion. As an athlete loads the leg reaching laterally, the leg stays in a relative neutral position to the pelvis as it remains directly below the hips. This is not the case for the trail leg, which is locked out and experiencing relative abduction when compared to the pelvis. Examples of this relative motion are demonstrated in Figures 3 and 4 below. It is the trail leg that experiences passive range and does not have a significant amount of neuromuscular loading. Therefore, exercises must be carefully implemented and managed to create specific outcomes that are actually seen in sport, not passive loading which many exercises create. Every coach must continue to decrease an athlete’s active to passive range of motion deficit, as this deficit is the most common place an injury is likely to occur. If an athlete lacks active, neuromuscular control over a range of motion, they will not have the ability to maintain appropriate position as they are passively experiencing the movement. It is this ability to control tissue in greater ranges of motion that must be actively sought after by all coaches and athletes. By placing the body into appropriate positions that are not normally experienced in training, the athlete learns to control their joint in these extreme ranges of motion. As athletes adapt to any stimulus provided, each individual becomes accustomed to these ranges of motion, ultimately leading to motor learning and tissue strength and tolerance. Motor patterning is defined roughly as the recruitment of a muscle in a coordinated fashion in an attempt to accomplish a desired task. When the body is completing a novel task the motor pattern functions inefficiently, but as an athlete experiences repetition at a specific joint angle and tissue length the movement is executed at higher efficiency, or co-ordination levels. Ultimately, every movement completed is a learned skill, with each requiring specific training in order for maximal efficiency to be achieved in performance. 3-D training methods aim to enhance the skill learning of athletes in planes, as well as ranges of motion commonly overlooked in training. Through correct coaching of these multi-planar exercises, many biomechanical issues are also addressed as joints experience appropriate articulation in these ranges of motion. By creating variability within movement, positions and demand coaches can drive neuromuscular stress and orthopedic articulation to create appropriate kinetic chains reactions and efficient biomechanics within their athletes. For instance, a coach can drive subtalar joint articulation and hip internal rotation by creating a rotational reach pattern. This is only created when movement from the hip and ankle are encouraged and taught as part of a kinetic chain reaction. Otherwise, many athletes may just reach or drive motion rotationally from their arms, shoulders, and/or T-spine. Many isolated mobilization exercises can improve articulation at a singular joint, but recreating the demand across the entirety of the kinetic chain teaches movement from appropriate zones. This leads to a reduction in dysfunctional movement patterns, or compensation patters, commonly displayed be athletes. In addition to the motor and movement pattern improvements, multi-plane training contributes to improved strength, particularly in the extreme ranges of motion. This enhanced strength is in part due to the increased neural drive and co-ordination in these positions (motor patterning described above), but is also due to improved tissue tolerance at these new lengths. Figure 5 below demonstrates the length-tension relationship experienced at the individual muscle fiber. 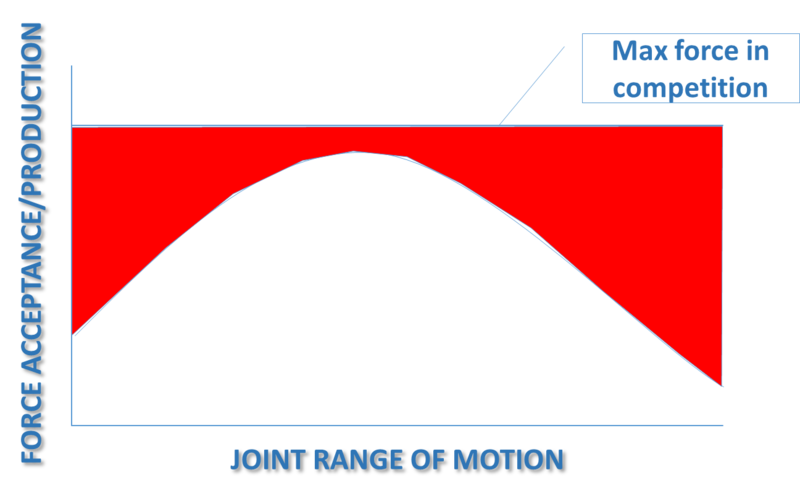 The majority of movements in athletics are completed within the “Normal Tissue Length”, however there are times, particularly when an injury occurs, that tissue enters the “Extreme ROM” (range of motion) lengths. With appropriate multi-dimensional training, the ability of an athlete to accept and produce high-levels of force is improved at these different tissue lengths. These training adaptations are demonstrated in Figure 6 below. The understanding that the majority of athletic movements are completed within a normal range has led to the emphasized training of maximizing force absorption and production within those “Normal” ranges. However, this method of thinking leaves the “Extreme ROM” zones, or the lengths experienced when an injury is sustained, in a weak and undertrained state. 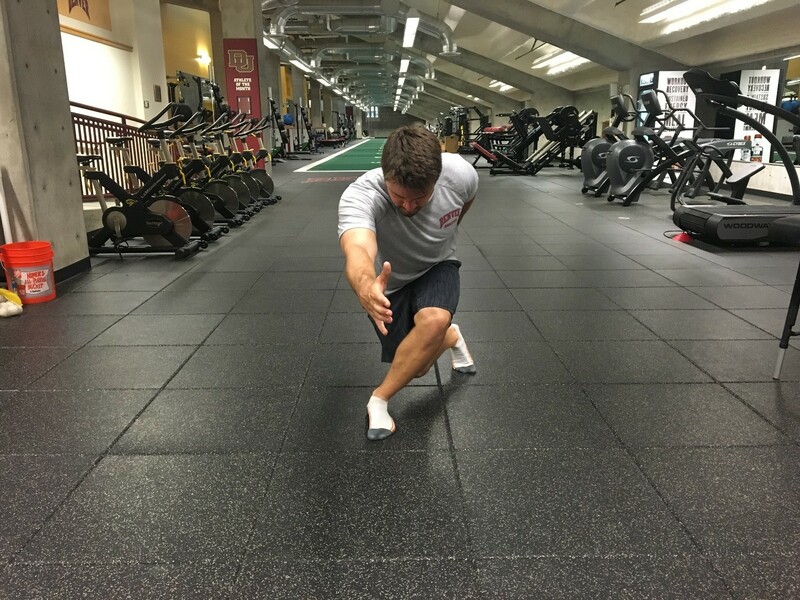 Multi-plane training, when implemented in a way that drives new tissue lengths, creates strength, and thus stability, at these uncommonly experienced tissue lengths or joint positions. This increased exposure, and resulting strength, leads to an even greater ability of the tissue to absorb and tolerate high force levels when extreme lengths are experienced. This returns to the concept of active to passive control. As an athlete experiences range of motion in new tissue lengths, they are capable of improving their neuromuscular control throughout the movement to a greater extent. Ultimately leading to a reduction in injury likelihood. 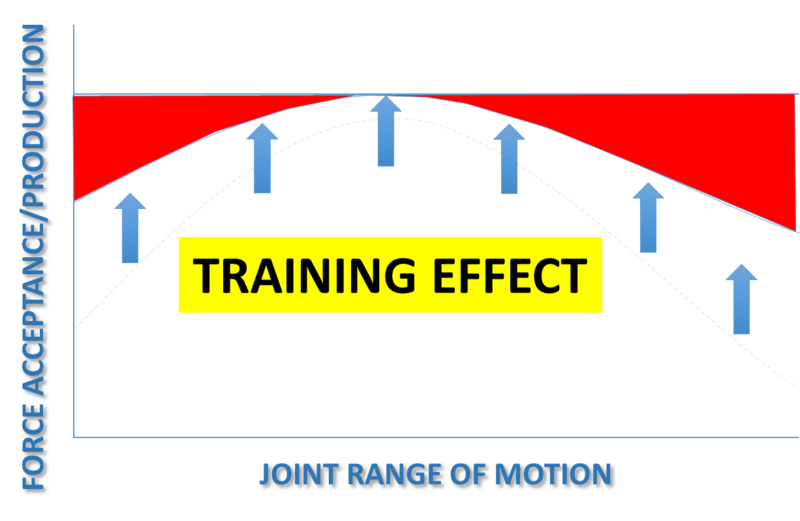 As explained above, a primary goal of the 3-D training methodology is to improve the functioning of both the joint and the tissue to optimally articulate and tolerate loads at the “Extreme ROM” zones. Just as performance coaches implement stress to cause a specific adaptation, disadvantageous positions can be applied in training in order to further reduce injury likelihood. By placing an athlete in these positions the ability to develop proprioceptive control is provided. This ultimately gives an athlete a strategy to maneuver in and out of disadvantageous positions experienced during competition and reduces the likelihood of sustaining an injury. Figure 7 demonstrates an example of an “awkward position” commonly experienced in a soccer match. 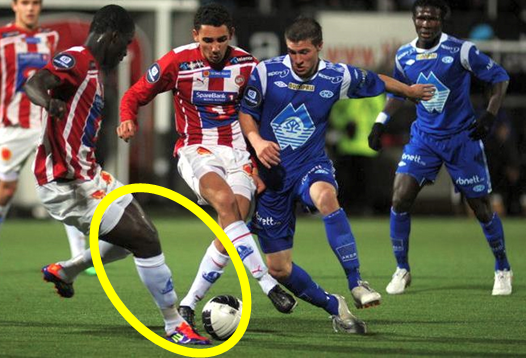 As the player plants his foot to make contact, adduction, or valgus at the knee occurs. This is a position most performance coaches avoid entirely in the weight room. However, if an athlete is never given a strategy to move in and out of this position in training, motor patterning and tissue tolerance will never be learned. Due to the highly reactive nature of athletics it becomes clear the body must respond in a rapid manner, leading to awkward positions, such as the one displayed in Figure 7. By providing an athlete these proprioceptive abilities and strategies in the awkward positions experienced, an athlete’s injury likelihood is greatly reduced. Ultimately multi-plane training methods aim to improve the athlete’s ability to decelerate, stabilize successfully, and attain proprioceptive control in awkward ranges of motion experienced in athletics. Every performance coach has learned the three planes of motion that are present in every athlete. However, the implementation of these different planes can become more difficult in a practical training setting. Coaches must understand the application of each plane of motion, even in what appears to be primarily single plane movements such as walking or running. By providing appropriate stimulus and training to all three planes of motion and the application of a joint by joint approach an athlete will improve motor patterning, their neuromuscular control in different positions, and their ability to get in and out of disadvantageous positions safely. Each of these adaptations lead to a greater ability to perform effectively while reducing the risk of injury, which should remain top priorities for all coaches. Through the better understanding of the spectrum of tissue lengths an athlete is exposed to consistently in specific sports, coaches can better prepare and condition athletes. This leads to a decreased injury risk and better reconditioning methods for athletes during return to play protocols.